Vietnam, Laos and Cambodia sit on what was the Indochina Peninsula. These countries had centuries of rich cultural history, long before French colonization and subsequent war. 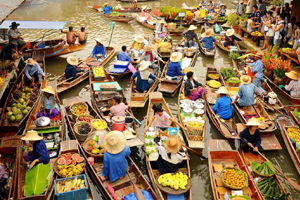 On this 12-day tour, we’ll take you to the modern yet traditional cities of Hanoi and Ho Chi Minh City, and to see the ancient temples of Luang Prabang and Angkor Wat. We will introduce you to local artisans, communities and experts to delve deeper than most tourists go. 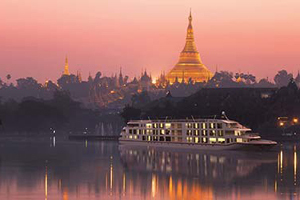 Our tour includes visiting caves where old Buddhist statues are taken to appease spirits, spending a romantic night on a traditional wooden junk, and marveling at the intricacy of artisans of a bygone era in palace and religious carvings wherever you go. Visit the Reunification Palace where the tanks of the northern forces broke through the gates signalling the end of the Vietnam War. Marvel at the giant temples, and the silent processions of hundreds of saffron robed Buddhist monks gathering early morning alms from the faithful. If you are inclined to wake up early you can even give alms yourself! Your journey is steeped in culture and history beset by natural beauty. We have included lush mountain ranges, flowing rivers and islands. We are sure a tour with our expert guides and exclusive access will show you the best this part of the world has to offer. 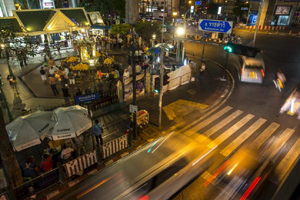 Upon arrival in Ho Chi Minh City, we will welcome and make sure that you are transferred to your hotel safely. The rest of the day is free & easy, allowing you time to settle in and begin your exploration of this amazing, vibrant city, still called Saigon by many. In the evening, you’ll meet your fellow My Way Travelers at a welcome dinner. After enjoying your breakfast, you set out for a half-day exploration of this marvelous former capital of French Indochina. The main landmarks include: the Reunification Palace; where the Vietnam War ended when the Vietcong stormed its gates; the People’s Committee Building, with its magnificent colonial style; the Municipal Theatre, also known as the Saigon Opera House; Notre-Dame Cathedral, with its red bricks and isolated location in the midst of the traffic on a large square; and the imposing Central Post Office. After lunch at Cuc Gach Quan Restaurant (Angelina Jolie and Brad Pitt were known to dine here), where you will enjoy beautiful yet simple, traditional Vietnamese food, you’ll visit the home of Tuyet Mai and Dinh Linha, famous husband and wife musicians. The couple’s home is a museum filled with an extensive collection of traditional musical instruments, many of which they made themselves. The day comes to an end with a visit to Ben Thanh Market, where locals shop amongst visitors. Dinner is at your leisure and there is no shortage of restaurants from which to choose. Your guide will be more than happy to recommend a restaurant to suit your taste. Relax in the morning whilst awaiting transfer to the airport and your flight to Hanoi. 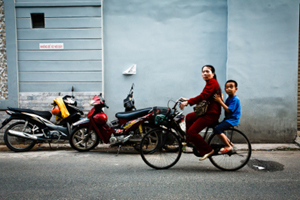 Our guide, will assist your exploration of the diverse architecture of old historical Hanoi and its small, less-visited streets. These sit among the famous 36 streets that make up the Old Quarter. Starting from Hoan Kiem Lake in the center of the city, we will pass along the street known for its coffee, Hang Hanh, literally “coffee street” as you head toward the Catholic Church. A delightful dinner will be taken at the famous Cha Ca La Vong restaurant. This restaurant serves only one traditional delicacy: cha ca; made from firm white fish fillet marinated in turmeric, garlic and ginger, before being cooked with onions and dill. It is then served as a salad with rice noodles, peanuts, fish sauce and even more dill showcasing the simplicity and freshness of Vietnamese cuisine. 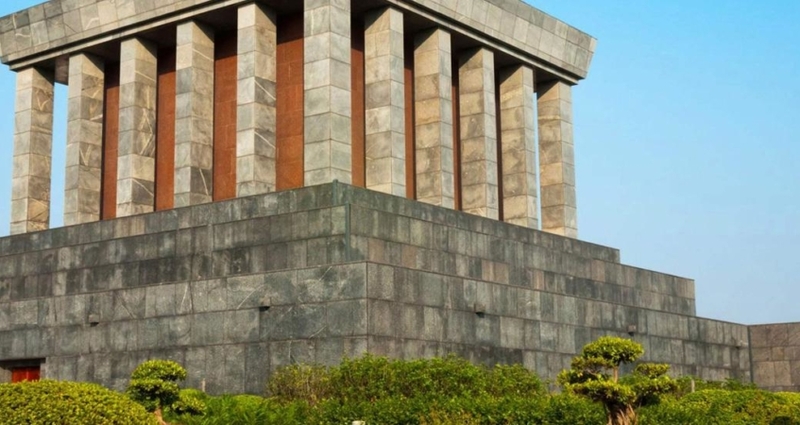 Your day begins at the Ho Chi Minh Mausoleum, the final resting place of the communist revolutionary leader in an imposing structure on the side of one of the city’s major squares. Then we will visit his former residence; a traditional stilt house. The One Pillar Pagoda, is a reconstruction of a famous Buddhist temple that was originally built in 1049. This is one of the most important and revered buildings in the whole of the country. Next, you’ll meet with a coffee expert to delve into the famous Vietnamese coffee culture. A way of life here, you will be introduced to a true a Hanoi specialty, egg coffee. After lunch, we have a meeting with a truly interesting character; Chuck Searck settled in Vietnam in the 1990s and now works to clean up unexploded bombs, helping victims of the war. The rest of the day is free easy for you to enjoy as you wish. We recommend you could continue your journey to understand the Vietnam War including the Hanoi Airforce Museum or the infamous Hoa Le Prison or ‘Hanoi Hilton’. There is an optional traditional water puppet show in the early evening, if you prefer. Dinner is also at your leisure and again our guides would only be too happy to help. This day is spent in one of the most beautiful places on earth. We travel to Halong Bay, a stunning UNESCO World Heritage site with almost 2000 islands of towering limestone rising improbably out of the waters in the Gulf of Tonkin. The waters were heavily involved as a theatre of conflict in the war, but now offer a tranquil location for the hundreds of tour boats that ply their trade here. We will board a private junk (a traditional Vietnamese wooden sail boat) which has been specially designed for overnight cruising. 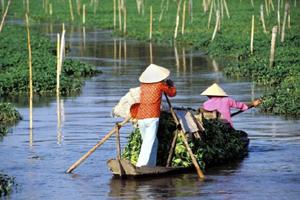 Throughout your cruise of Halong Bay your boat is staffed with your own captain, chef and waiter. Enjoy a superb meal of fresh seafood on deck as you enjoy the limestone formations amidst the tranquil waters..
After breakfast on board your delightful junk, you will return to Hanoi (lunch provided en route) and later take an evening flight to Luang Prabang. This former capital of Laosis now yet another UNESCO World Heritage Site. 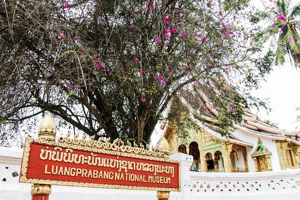 It sits surrounded by mountains at the confluence of the Nam Khan and Mekong rivers. It is home to numerous Buddhist temples or “wats”, the sights, sounds and smells of the temples, make this a beautiful experience. In the morning, we take you visit just a few of the 100 or more temples here. These are considered among the most beautiful in Laos. Wat Xieng Thong, or the Temple of the Royal City, is a vast sprawling collection of sacred buildings. We move on to explore Wat Visoun, the oldest temple in the city, with wooden-framed windows inspired by the Khmer Temple of Wat Phou. 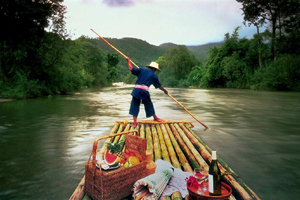 We will then drive to the pier and embark on a traditional boat cruise up the mighty Mekong River. We will stop at a local village for you to enjoy a home-cooked lunch. After lunch, we visit the mystical caves of Pak Ou, called Tham Ting by many locals. These caves house hundreds of Buddha statuettes. The local population believe that the caves are the homes of spirits, and take their damaged and old statues of Buddha there, for good luck. Later we will cruise back to Luang Prabang while enjoying sunset over the Mekong, on deck. Your evening is free for you to possibly visit the Hmong Night Market, where Hmong, mountain ethnic people, come to sell their handmade wares. 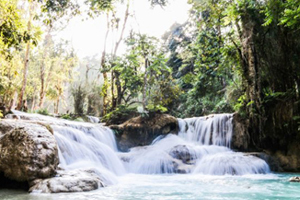 After breakfast, We set out to Kuang Si Waterfalls, a lovely three-tiered waterfall tumbling down the rocks into turquoise pools. We’ll pay a visit to a local house to join in a Lao cooking class and eat the fruits of our labours. The hostess/chef grows all her own ingredient, and will show you round her vegetable and fruit gardens whilst giving a talk about Laotian food. We then go back to the waterfalls, where you may take a dip in the cooling waters if you wish. On the return journey, we’ll stop of at local villages to witness the making of decorative and artistic Saa paper and traditional woven textiles. Dinner is in your own time. Early morning Luang Prabang is like no other place. 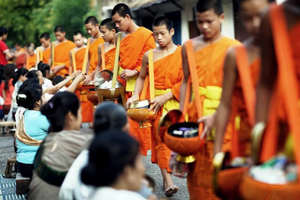 Get up early to witness the sunrise and watch monks in their saffron robes silently glide through the town, collecting alms as they go in a tradition spanning hundreds of years. Please be respectful of this holy occasion. We ask that you watch them in silence without disturbing them. If you want to participate, ask your hotel for an offering like sticky rice for instance, and let the monks take it without comment. The rest of the day to mid-afternoon are free to further explore the city. Later, we fly to Siem Reap Cambodia, the gateway to the marvelous Angkor temples. Upon arrival you will enjoy a delicious dinner at the hotel. 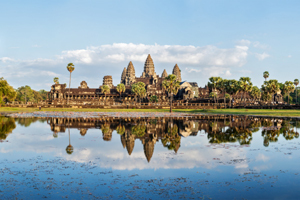 Today you will marvel at the incredible temple that is Angkor Wat, a UNESCO World Heritage site with huge carved towers and extraordinary bas-reliefs filling the walls. This extraordinary temple complex was erected in the 12th century in honor of the Hindu god Vishnu. It is truly awe-inspiring and the largest religious monument in the world. The complex originally had many more buildings than those that survive to this day. The sandstone constructions have no mortar between stones, and are the subject of constant conservation efforts. We will take you by private vehicle or, if available, cattle cart to a remote, untouched temple, for a private picnic lunch. This is an astonishing place in which to relax for awhile, whilst enjoying a soothing foot massage and contemplating the unique history of the area. In the afternoon, we visit the ancient Ta Prohm, where immense kapok trees have almost consumed the temple nickname the Jungle or Tombraider Temple. Dinner is at your leisure. Today we pay a visit to Angkor Thom (the Great City), entering by the south gate and immediately discover the famous Bayon, built in the 12th and 13th centuries. This temple is a perennial favourite. It is a Buddhist temple composed of 54 gigantic towers featuring no less than 216 gently smiling faces of Avalokitesvara. Next it’s a short walk to the Terrace of the Elephants and the raised Terrace of the Leper King.Also built in the 12th century, it features many beautifully sculptured Apsara dancers. After some free time for lunch, we travel to Banteay Srei, to see a most impressive jewel of Khmer art. This beautiful 10th century temple was dedicated to the Hindu God, Shiva. It is a small pink sandstone temple, also known as the Citadel of Women. There are some remarkably well-preserved and hand sculptured lintels. This was made famous in 1923, by André Malraux who returned the Apsara heads that he had previously removed. We then return to Siem Reap pausing at a golden silk farm.. The artisans here will demonstrate all the stages of traditional silk production, from breeding the worms to making and dyeing the silk. As evening arrives, we will gather one final time for a farewell dinner at one of the finest restaurants in Siem Reap. We invite you to spend the last few hours of your incredible trip by the hotel pool. 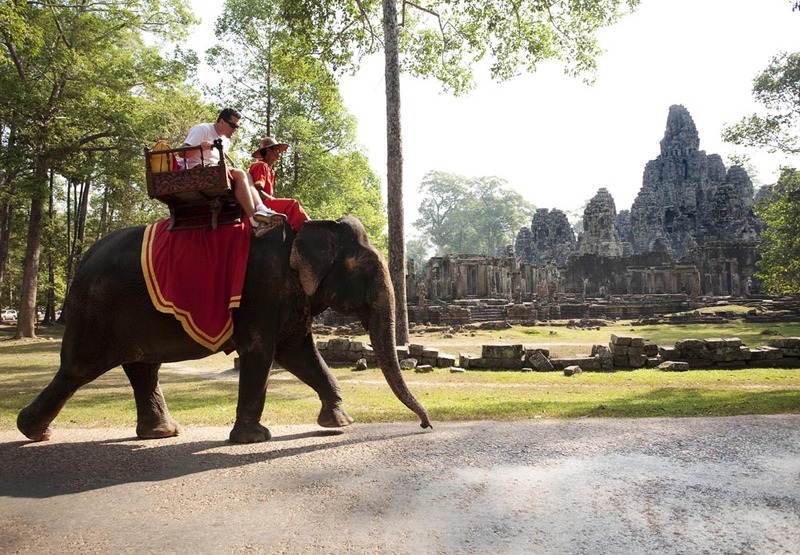 Alternatively you may wish to stroll around Siem Reap as you wait the arrival of your your transfer to the airport. Your Hotel room remains at your disposal until noon. 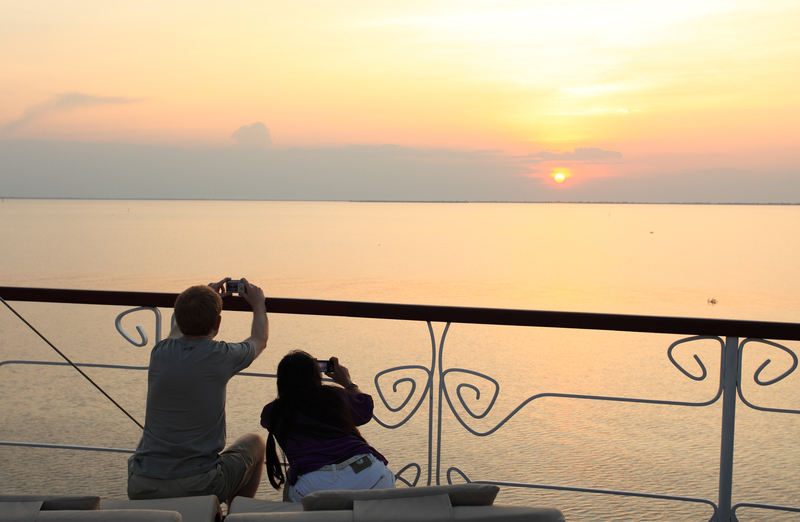 We hope your trip with us has been memorable and rewarding. Call us at +84-902-011-200 to request a quote for your preferred accommodation and departure date.